He abandoned her outside with no food or water — but she’s SO happy now. When Rubble’s owner moved to California, he didn’t bother taking her with him. 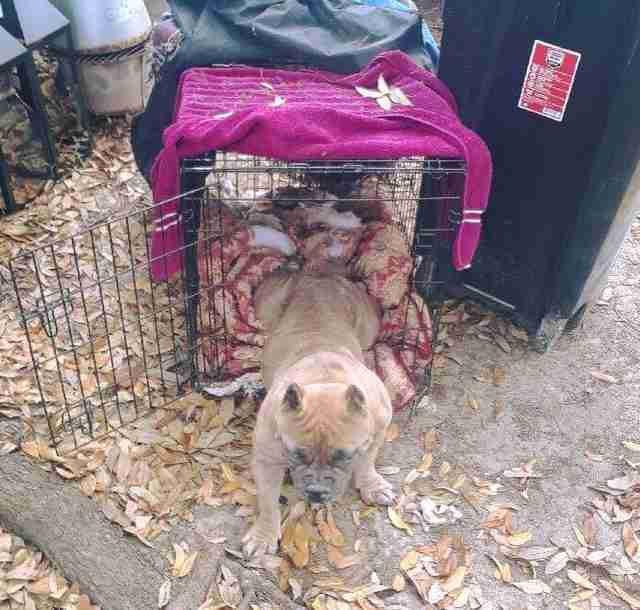 He just left her outside his old house in Houston, Texas, without food or water, and only a small mesh kennel for shelter. The owner had bought Rubble to breed her. 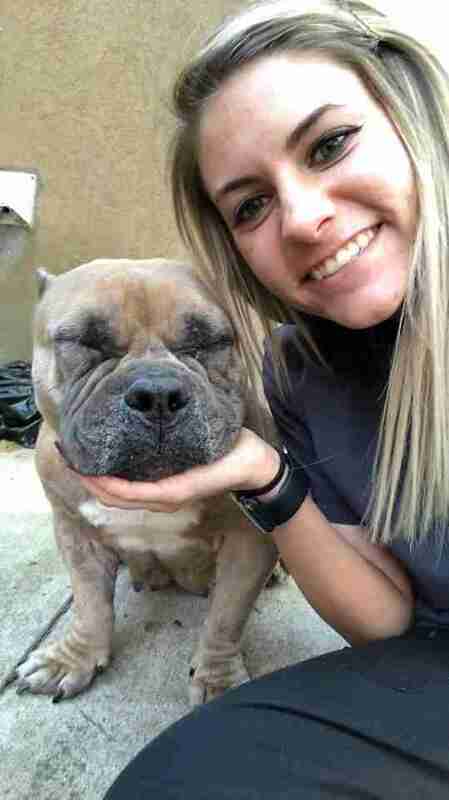 But when the 4-year-old American bulldog couldn’t get pregnant, the owner decided he had no use for her — which is probably why he abandoned her so easily. After the owner’s departure, a couple of family members quickly realized that he’d left Rubble. They tried calling him, but he wouldn’t pick up his phone. So they reached out for help in the dog-rescuing community, and a woman named Alyssa Aguilar stepped up to help. She and her boyfriend immediately went to collect the abandoned dog. 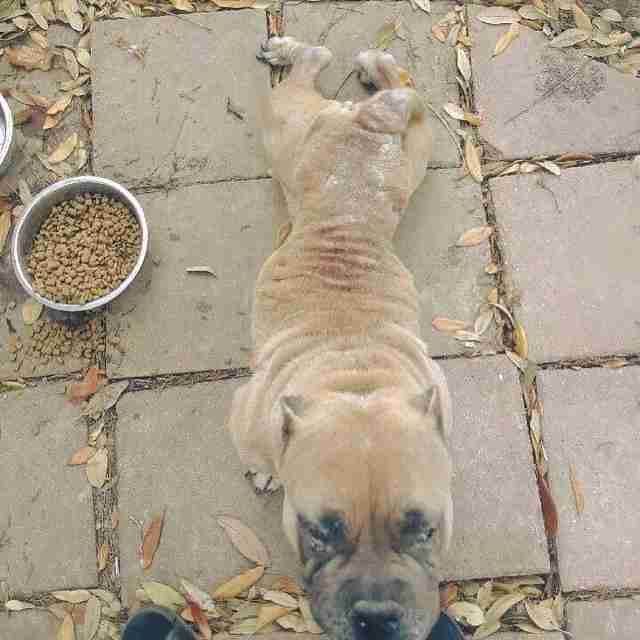 Sadly, Rubble was already in terrible shape — skinny, malnourished and suffering from a skin condition. 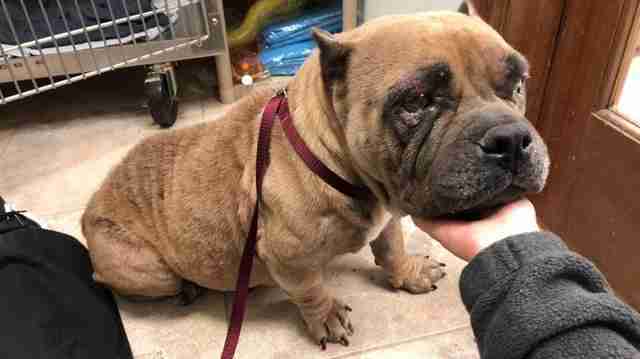 Rubble was also covered in scabs from itching her skin. She urgently needed to see a vet. Aguilar got in touch with her friend, Laura Forma, who organized for A Chance to Bloom Dog Rescue to take Rubble into its care. Then Aguilar dropped Rubble off at the vet. When Rubble got on the scale, everyone got a shock. 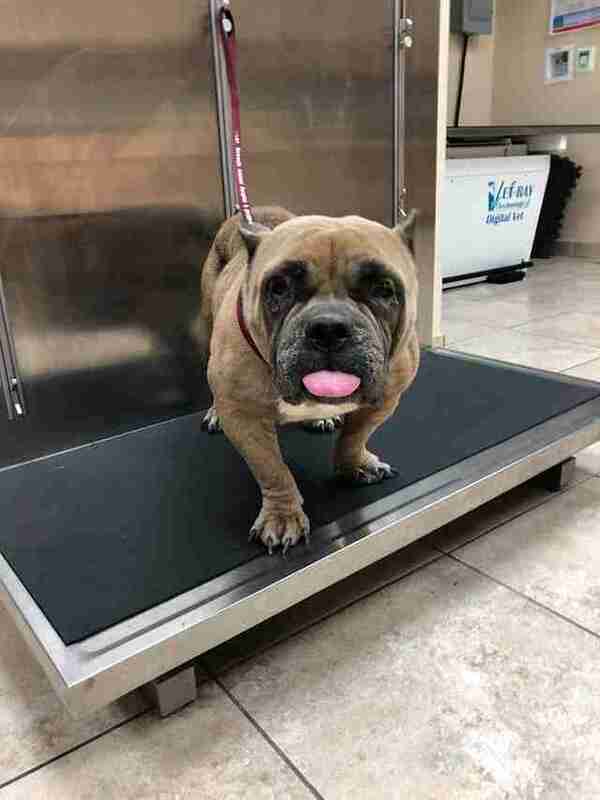 She only weighed 44 pounds, even though adult American bulldogs should weigh between 80 and 100 pounds, Dr. James Barr, a board-certified vet at BluePearl Veterinary Partners, told The Dodo. Rubble’s skin condition turned out to be from severe malnutrition and flea dermatitis, and the vet placed Rubble on a treatment plan. 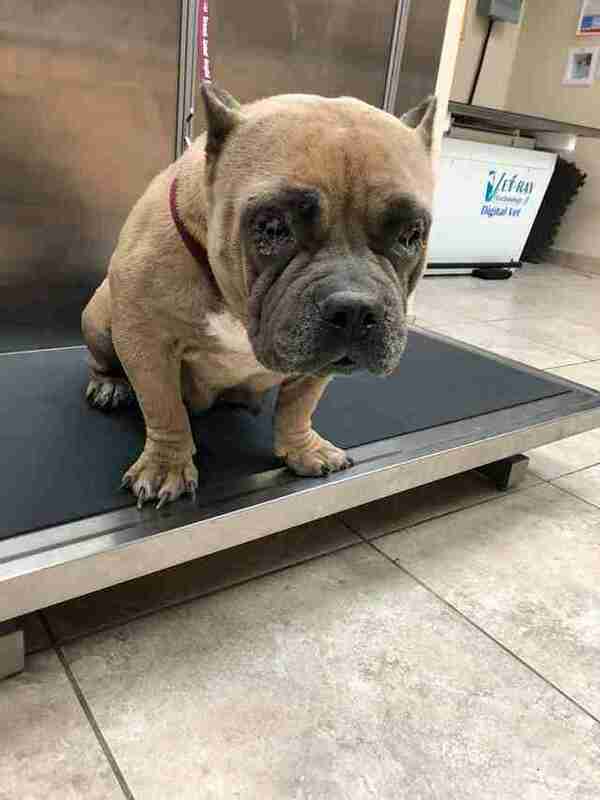 Rubble also had an issue with her eyes — the vet suspected it was eyelid entropion, a genetic condition that makes a dog’s eyelids fold inward, and requires surgery to correct. 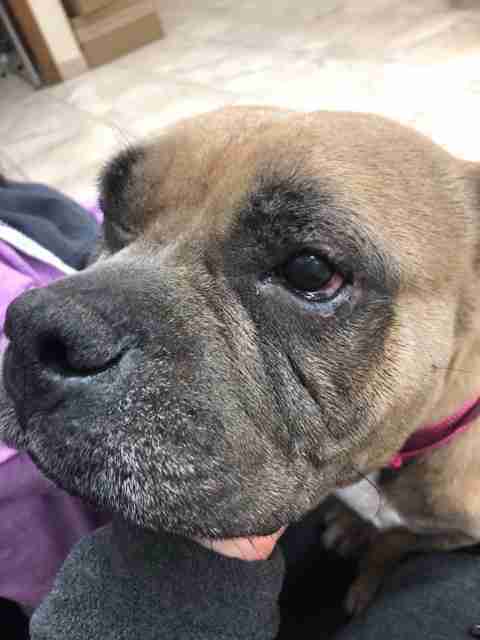 After Rubble’s vet checkup, she went into foster care with Alyssa Staloch, who will keep Rubble until she’s gained weight and gets surgery on her eyes. Despite everything Rubble has gone through — and is still going through — Staloch can’t get over how affectionate Rubble is, and how trusting she is of people. Everyone thinks that Rubble will make the perfect companion for the right family — and they will make sure her next family doesn’t abandon her. If you’re interested in adopting Rubble, you can contact A Chance to Bloom Dog Rescue.